By 2015, Windows Phone 7 will power 37 per cent more smartphones than Apple's iPhone, according to the prognosticators at International Data Corporation (IDC). "Up until the launch of Windows Phone 7 last year, Microsoft has steadily lost market share while other operating systems have brought forth new and appealing experiences," said IDC analyst Ramon Llamas in a press release accompanying his company's latest Worldwide Quarterly Mobile Phone Tracker, released Tuesday. But the recent Redmond-goes-to-Espoo deal will halt that slide, IDC contends. "The new alliance brings together Nokia's hardware capabilities and Windows Phone's differentiated platform," Lamas opined. "We expect the first devices to launch in 2012. 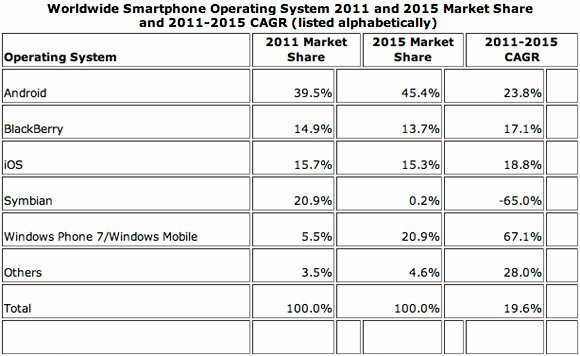 By 2015, IDC expects Windows Phone to be number 2 operating system worldwide behind Android." That number-two market-share ranking of 20.9 per cent, however, will be less than half that of IDC's projected number-one smartphone operating system, Google's Android, which IDC says will hold a full 45.4 per cent of the worldwide smartphone market share in 2015. "For the vendors who made Android the cornerstone of their smartphone strategies, 2010 was the coming-out party," gushed Llamas. "This year will see a coronation party as these same vendors broaden and deepen their portfolios to reach more customers, particularly first-time smartphone users." Apple's iPhone, by contrast, will limp along in the number-three spot at a mere 15.3 per cent in 2015, down from 2011's 15.7 per cent. RIM's BlackBerry, according to IDC's crystal ball, will slip from 14.9 per cent in 2011 to 13.7 per cent in 2015. In addition, IDC doesn't project a sunny smartphone future for either HP/Palm's webOS or Intel's Meego. The analysts' catch-all Others category captures a mere 1.1 per cent more market share between 2011 and 2015, rising from 3.5 to 4.6 per cent. Those market share slices will, however, be cut from an expanding pie. In 2011 alone, IDC says, smartphone sales will grow 49.7 per cent – from 303.4 million handsets in 2010 to over 450 million in 2011. From where we sit here at The Reg, IDC's projections need a sprinkling of more than a few grains of cautionary salt. What exactly, for example, does IDC include in its definition of an "Android smartphone"? Does it lump cheap Chinese knockoffs (which Engadget has dubbed KIRFs, for Keeping It Real Fake) along with the "Pure Google" Nexus S? It would appear so. With an iPhone, BlackBerry, or Pre, you know what you're getting: a phone that can be loaded with most if not all the apps available for that platform, and one that – for a generation or three, at least – can accept OS upgrades. With an Android phone, you might be stuck back at Android 1.5 with no upgrade path and no guarantee that you can stuff your handset with stuff from the Android Market. Also, IDC's projections seem to indicate that most – all? – current Symbian users will move to a Nokia Windows 7 phone once they become available worldwide. That's possible, but far from certain.